The dining table is a major focal point of any home. It's where family and friends congregate to share stories, laugh, and enjoy home-cooked meals. Dining room table dimensions and shapes can also set the mood of the room. Rectangular is refined and circular is cozy, while oval and square pieces strike a calm balance between the two. When trying to determine the proper dining table size and shape, let the room's dimensions, decor, and the needs of your family guide you. Since dining room table dimensions vary between manufacturers, take careful measurements before making your purchase. Leave 36 inches of space between the table and walls for chairs and foot traffic. Along each side of a rectangular table, allow for a minimum of 23 inches between diners as well. When you combine properly shaped furniture with the correct interior space and design, the room flows and functions flawlessly. 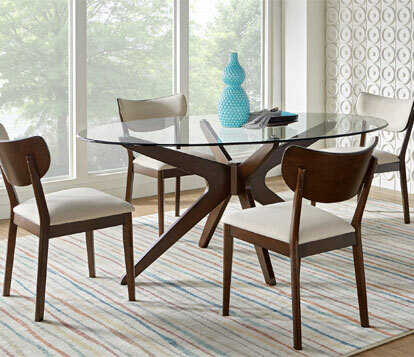 Most dining rooms are rectangular, adding to the appeal of an angular table. Any piece narrower than 36 inches will likely cause space issues, especially if you want to set out food all at once. Many families with smaller tables add serving trays or a sideboard. 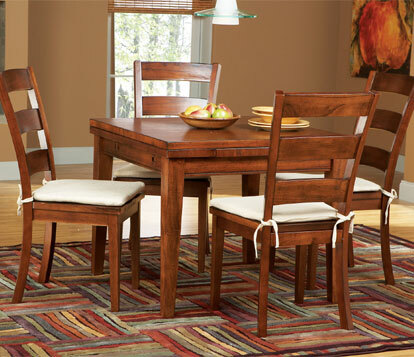 When seating four people, standard dining table sizes for rectangular tables are 36 inches wide by 48 inches long. These pieces comfortably fit a small family while leaving elbow room between each diner. Twelve inches are added to the length of tables intended to seat five or six people, and 78-inch-long tables accommodate up to eight. In general, traditional rectangular dining table dimensions take up a lot of room and are better suited for large families and get-togethers. Rectangular pedestal or trestle tables are a good alternative, as they are supported by or one or two columns rather than a leg in each corner. This gives them greater legroom and makes the most out of the available space. Adding a bistro feel to dining rooms, kitchens, and breakfast nooks, a square table can be a good fit for contemporary homes. Square dining table dimensions work best in boxy rooms with limited space and are intended for a small number of diners. Tables with a drop leaf design can be expanded, allowing for additional seating. Each two-foot extension accommodates an additional two adults. Standard dining table sizes for square pieces are 36 by 36 inches and 60 by 60 inches, seating about four and six people, respectively. 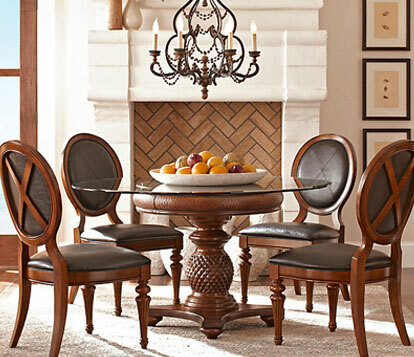 In some dining room layouts, a circular or oval table better suits the needs of the space. No corners means easier navigation in close quarters and a clear view of all diners while seated. In general, circular dining table sizes with a 48 inch diameter can host four, while 60 inch dining table dimensions seat eight or nine. 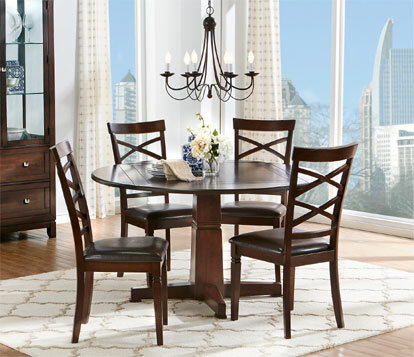 Round tables feel cozy and intimate, perfect for couples or small families with limited space. Some circular tables widen into an oval shape to make space for additional guests. Oval tables are often used for smaller rooms that still need to seat four or more people. They provide nearly as much surface area as a rectangular piece, but occupy much less visual space. As with circular tables, guests can dine near edges and aren't limited by corners. For larger parties, alter the dining room table dimensions by extending the length with removable leaves. This feature comes in handy during holidays, birthdays, and family reunions. 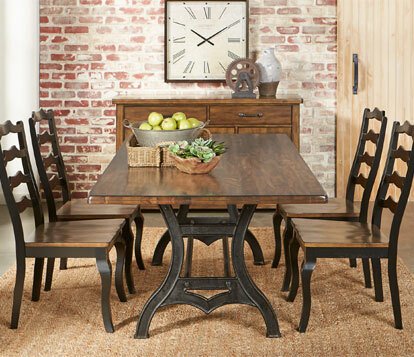 When buying a drop leaf table of any shape, make sure the room is able to accommodate the change in dining table size. While searching for dining room table dimensions that complement your space, keep a measuring tape on hand. If buying a matching set isn't an option, be aware that the sizes of chairs and tables need to work with each other. Chairs are typically 18 inches from the floor to the seat. Find a chair that's comfortable and test it against a number of dining table sizes to see what works best. Most adults find optimal comfort with 12 inches of space between the seat of the chair and the tabletop. In general, the backs of the dining chairs should reach to at least the height of the table to appear proportional. Most dining table dimensions feature a height between 28 and 30 inches tall, which is enough space for most people to dine comfortably. 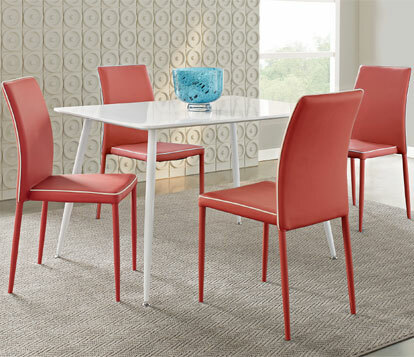 Some tables are even as short as 24 inches, requiring lower chairs to balance the lack of height. On the other end of the spectrum, counter height tables are typically 36 inches tall, the same height as a kitchen counter. These pieces work great in apartments where there's no separate dining room, and should be paired with counter-height chairs or stools.